It’s rare that you’ll find me recommending the installation of a toolbar. But, today only, if you shop through Upromise’s TurboSaver toolbar at Apple Store, they’ll double their promotional cashback rate of 10% to 20%. And if you’re a Upromise credit card holder, you’ll get an extra 3% on top of that! What makes this an absolutely amazing deal? Simple: the best cashback rate for Apple Store is usually 1 to 2%. 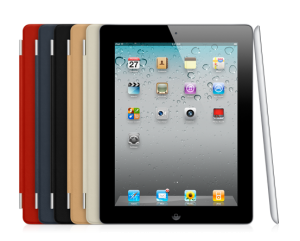 Time to get the new iPad, iPod, or iPhone you’ve been wanting! 2. Download and install the Upromise TurboSaver toolbar. 3. On the browser plug-in confirmation page, opt-in to Super Site Days for twice the college savings on Saturdays in May and June. 4. Use the toolbar to shop at Apple Store. The fine print: this doesn’t apply to the iTunes store, just to Apple Store purchases. Your order has to be placed before 11:59pm ET. Your reward will be deposited into your Upromise account by August 31st. You can request your cashback in the form of a check, or you can apply it toward an outstanding student loan or transfer it into a 529 college savings plan. If you don’t have a Upromise credit card yet, please let me send you a referral link (they’ll kick me back $10 and I’d really appreciate it). I use my Upromise card a lot because of the 1% cashback minimum no matter where you shop, a bonus 3% cashback on shopping orders placed through Upromise’s site, and other promos like the one going on now with 5% cashback on restaurants, gas stations, and grocery stores. Grab your 20 (or 23%!) cashback on Apple Store purchases through Upromise today only! A) Why wasn’t this offer 2+ weeks ago when I ordered 2 iPads? B) Why didn’t my feeble brain remember to have the good sense to get ANY sort of cashback when I did order them? I am slipping bigtime. How sad that I lost such a nice reward for shopping. I make me mad sometimes. I MUST get my act together. THIS is a nice deal. Great post and sad that I missed it.